Vintage Heavy Cut Glass Square Crystal Decanter Stopper Germany NICE. 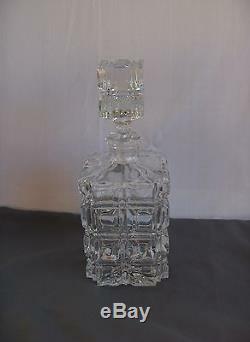 Up for sale is a beautiful vintage heavy square cut glass crystal decanter (7.25" tall no stopper, 10.75" with stopper, 4.50 square, 4.50 lbs) made in Germany. From a fine old Denver estate, it has never been used, only stored. We do our best to describe each item, but we are not experts. We do not know the history of most items but will always tell you all that we do know. Our environment is "smoke free", however, we cannot grantee that all the items we sell come from the same environment. Visit Our Store for Complementary Items. The item "Vintage Heavy Cut Glass Square Crystal Decanter Stopper Germany NICE" is in sale since Monday, February 24, 2014. This item is in the category "Collectibles\Barware\Decanters\1970-Now". The seller is "qirisma123" and is located in Golden, Colorado. This item can be shipped worldwide.